The concrete5 package format is a way to bundle most aspects of concrete5 functionality together, so that they can be easily distributed, installed and uninstalled. The package format is used by the concrete5 marketplace, but can also be used without connecting to concrete5.org. 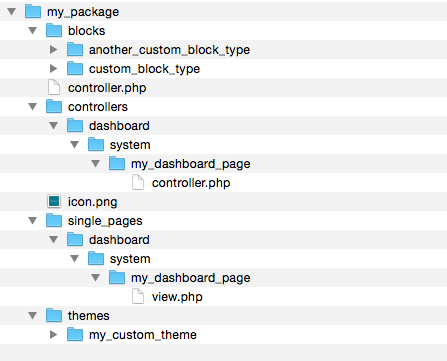 In general, when building a package, you'll start by building your item of functionality (block type, theme, etc…) in your application/ folder, and installing it manually through the Concrete5 dashboard. When it's done and ready to go, you move it into a package folder. Then, you'll have to add some custom code to the controller.php in order to install these items when the package is installed, but that can usually be done pretty easily. Once that's done, the items of functionality will automatically install when the package is installed, and will also automatically uninstall when the package is removed. Additionally, custom code can be run when a package is present and installed in a concrete5 site, but won't be run when the package isn't installed – making packages an ideal way to deliver custom event-based functionality as well as simpler items like block types and themes.